Every American knows that the Fourth of July is a patriotic holiday that is observed by the entire United States to celebrate our independence from Britain. Although our independence wasn’t official until after the American Revolution ended, the Declaration of Independence was formally adopted by the Continental Congress on July 4, 1776. Americans all over the world honor the Fourth of July Holiday with speeches and editorials (most of the time these speeches and editorials are centered around some patriotic theme), as well as other customs involved in the celebration of our independence. Here are some customs that are typically involved in our modern Fourth of July celebrations. • Fireworks — the fireworks are usually accompanied by patriotic music, if it is a professional show. 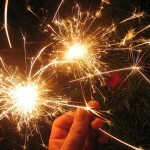 Many states have professional fireworks shows and a few states allow fireworks to be sold for personal use to celebrate the holiday, but due to safety concerns many states are starting to ban personal fireworks, although traffickers will smuggle them into the more restrictive states so that people can celebrate in style. • Picnics and barbecues — many people gather together for either a picnic or a barbecue at a park or beach while they are waiting for the firework shows to start. • America’s Freedom Festival in Provo, UT. This festival includes one of the largest Fourth of July parades and the Stadium of Fire. • Bristol, Rhode Island has the oldest, continuous Independence Day celebration in the United States. A red, white, and blue center stripe marks the route of the parade. People begin getting ready for the Fourth of July in the month of June when work crews repaint the center stripe that marks the route for the parade. • Nathan’s Hot Dog Eating Contest in Coney Island, Brooklyn, New York City is a colorful Independence Day event. It was supposedly first held on July 4, 1916 as a way to settle a dispute among four immigrants as to who was the most patriotic. • In 1959 NASCAR started holding the Pepsi 400 on July 4th or the Saturday of Independence Day weekend. Minor and Major League Baseball games are also a huge hit on July 4th. Here are some ways the Fourth of July was observed during the early years. • 1777 — In Bristol, Rhode Island thirteen guns were fired in the morning and the evening to mark the thirteen colonies declaration of freedom. Philadelphia celebrated the 4th of July in a way that many Americans will find familiar. They had an official dinner for the Continental Congress, toasts, 13-gun salutes, speeches, prayers, music, parades, troop reviews and fireworks. Ships that were in the harbor were decked out in red, white and blue buntings. • 1778 — George Washington marked the 2nd anniversary of the Fourth of July with a double ration of rum for his soldiers and an artillery salute. For this anniversary John Adams and Ben Franklin were in Paris, France and honored the holiday by holding a dinner for their fellow Americans. 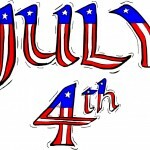 • 1779- The Fourth of July actually fell on a holiday so the celebration was moved to Monday, July 5th because Sunday was a day of rest and church services. • 1781 — Massachusetts was the first legislature to recognize the Fourth of July. 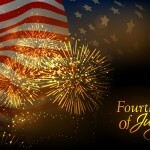 • 1783 — Moravians in Salem, North Carolina held the first celebration of the Fourth of July in the country with a music program led by Johann Friedrich Peter and was titled Psalm of Joy. While the actual celebration and events have changed over the years. the basic customs are still the same. People get together in large groups, decorate houses with the American Flag and in the colors of red, white and blue, while they cook a large meal and wait for evening to fall so they can see the fireworks. The only thing that has really changed is the type of food we eat and the type of fireworks that we participate in. In the olden days it was more of a sit down meal while today it is very informal and the fireworks now are far better than the 13-gun salute or cannons firing into the air. But it doesn’t matter how we celebrate the Fourth of July; what matters is that we are celebrating our Independence from Great Britain’s rule and honoring our founding fathers who worked so hard to get us where we are today. "Some History Behind Independence Day Customs." Surfnetkids. Feldman Publishing. 29 Jun. 2007. Web. 21 Apr. 2019. <https://www.surfnetkids.com/independenceday/229/some-history-behind-independence-day-customs/ >.